Creating a luxurious, spa like bathroom at home can be within your grasp. The key to an elegant, yet simple bathroom is choosing the right products that create a relaxing environment. The use of bamboo in the bathroom is an elegant way to create a spa like feel to any home. The eco-friendly material offers simplicity in design and durability for home use. The Toilettree Bamboo Bath Mat can transform a home bathroom into the zen, spa like feel. 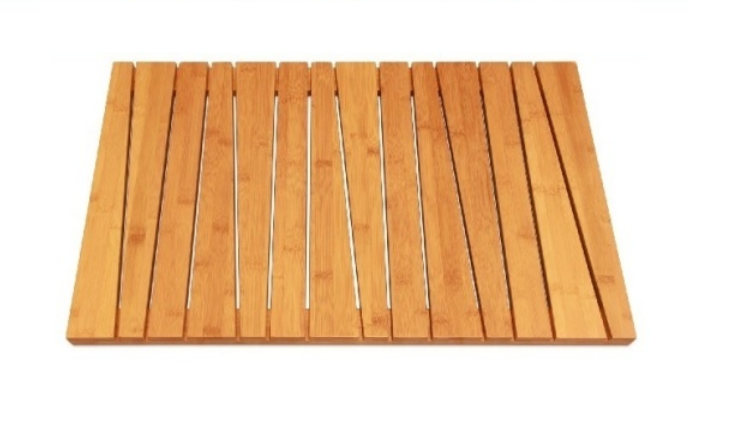 The Toilettree Bamboo Bath Mat offers simple, modern style in an eco-friendly material. Made from 100% natural bamboo, the thickness and solid feel of the bamboo bath mat convey the quality of the materials used. Whether used in a master bath or as a statement piece in a shared bathroom, this bamboo bath mat is as functional as stylish. In our home, the Toilettree Bamboo Bath Mat is used in the hallway, shared bathroom. With multiple children taking nightly showers, the cotton bath mats would get damp and dirty quickly. Even after just one shower, the traditional bath mat would take hours to dry. If I picked it up in the morning, the cotton mat could still be damp. Since we've replaced the old mat with the new Toilettree Bamboo Mat we don't have a damp issue. Without having to continually wash a bath mat, I have less laundry. The Toilettree Bamboo Mat gives more free time in a stylish package. The Toilettree Bamboo Bath Mat is rectangular in shape. It is 25.3 in. L x 15.7 in. W x 1.3 in. H. The bamboo bath mat can be purchased on-line for approximately $39.99.